LAS VEGAS—When several reporters for the main newspaper in Las Vegas were taken off their beats and assigned to investigate three judges, the decision seemed strange because it came from the paper’s new owners, not a newsroom editor. The mystery deepened weeks later, when the public learned that casino mogul Sheldon Adelson and his family had purchased the paper in a secretive deal. 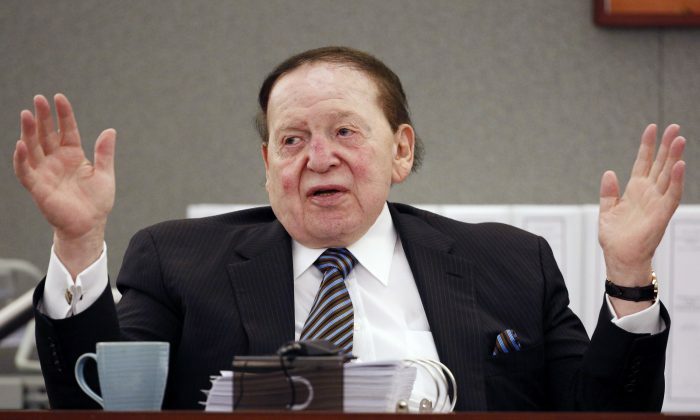 And the questions only intensified, leading the staff of the Review-Journal to publish a front-page story about suspicions that the owners had attempted to use the paper to settle a personal score with a judge handling a lawsuit against Adelson, a wealthy political donor known as a Republican kingmaker. On Dec. 22, the Review-Journal editor who decided not to run anything on the three judges told the staff he was stepping down after accepting a voluntary buyout. Mike Hengel stunned the newsroom with his departure, which was announced Wednesday on the front page in an article that said an unspecified number of other employees had also accepted buyouts. “I think my resignation probably comes as a relief to the new owners,” Hengel said in an audio recording obtained by The Associated Press. Many of the questions center on a small Connecticut newspaper that published a story singling out Elizabeth Gonzalez, one of the Nevada judges who was monitored by the Las Vegas reporters. The New Britain Herald called her rulings “inconsistent” and “contradictory” and cited them as evidence for why Connecticut may not want to consider creating specialized business courts. As news organizations adapt to an ever-changing media landscape, many newspapers have changed hands, with some being acquired by billionaires. The judge has clashed numerous times with Adelson’s attorneys in a high-profile wrongful-termination lawsuit brought against Adelson’s casino company, Las Vegas Sands. Earlier this year, Gonzalez admonished Adelson in court for not answering a routine question about work emails, telling him he could not argue with her. The publisher of the Connecticut paper is Michael Schroeder, who also happens to be the manager of a Delaware company formed to facilitate the purchase of the Review-Journal for the Adelsons. Schroeder was introduced to the Review-Journal newsroom on Dec. 10, and he was the one who initially refused to identify the newspaper’s new owners. It was not clear if the other two judges—a Las Vegas justice of the peace and a Clark County family court judge—had any connection with Adelson. The newspaper report said they were selected by the reporters. Gonzalez was selected by someone at the Review-Journal, but not within the newsroom, because she specializes in business lawsuits and is handling unrelated cases involving Adelson and fellow casino mogul Steve Wynn, the report said. As news organizations adapt to an ever-changing media landscape, many newspapers have changed hands, with some being acquired by billionaires. But few American newspaper owners have a political agenda to rival that of Adelson, who has contributed tens of millions to GOP campaigns. Gatehouse Media, the paper’s former owner that will continue managing it, has said Adelson has no intention of using the newspaper as a platform.